LACURE OFFICINE's integrative programme is based on a global approach which combines face and body care as well as lifestyle to restore your youth and well-being. The brand's mission is to help people enhance their potential to appear and feel younger, and to live a healthier, happier and more rewarding life. Unlike most cosmetic treatments, which only work on the outside, Lacure Officine’s integrative programme works globally to improve the health of every cell in the body. Only this kind of complete care gives the body the fundamental transformation that it needs to maintain its well-being capital. This is about making a real choice: for a sustainable, easy and fulfilling lifestyle. According to LACURE OFFICINE’s philosophy, beauty and well-being are not just external, they reflect our balance and our lifestyle. LACURE OFFICINE is founded on the principle that living younger, longer and beautifully is a choice you can make every day. Adopt healthy inner and outer habits that revitalise every cell in your body and improve your overall well-being and beauty..
Because every aspect of your life influences every cell in your body, everything we do at LACURE OFFICINE is designed to help activate your youth capital. COSMECEUTICALS are the first step in LACURE OFFICINE's integrative programme. Our treatments target skin problems using nutritious, restorative and regenerative care. They are effective in helping to strengthen and protect the skin; the first line of defense for every cell in the body. These treatments are part of an overall systemic approach. The second step of the integrative program LACURE OFFICINE is based on targeted nutrition, alkaline antioxidant and high performance. NUTRICOSMETICS, or food supplements, are recommended during this 2nd stage. Optimal cellular nutrition helps restore the body's performance and makes it more resistant to weather and lifestyle changes. 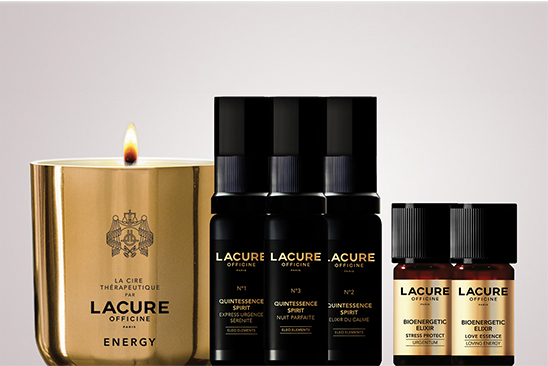 The third stage of LACURE OFFICINE’s integrative programme involves EMOCEUTICALS. The third stage of LACURE OFFICINE’s integrative programme involves NEURO-COSMETICS. These are high-performance aromatherapy products that help you achieve better emotional well-being, protecting the body from stress.Managing stress, maintaining a healthy connection with yourself and everything around you, as well as a positive social environment will nourish your psyche.The key to improving health and appearance is a balanced life involving body and mind. Taking the time to take care of yourself is not a luxury! It is the key to a perfectly harmonious life. Know more about the NEURO-COSMETICS. By participating in physical activities that help you fight the ageing of your skin and body and prevent a large number of age-related ailments. Sport reduces stress and its harmful effects. Physical activity is beneficial to fight against ageing and brings the joy of building muscles that maintain optimal moisture.